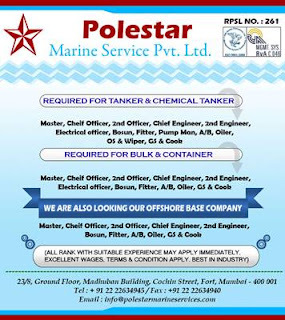 SEAMAN JOB INFO - Poste/Jan/2019 Polestar Marine Service Pvt. Ltd opening crew recruitment for Indian seafarers join on Tankers, Bulk Carrier, Container, Offshore Vessels deployment A.S.A.P. 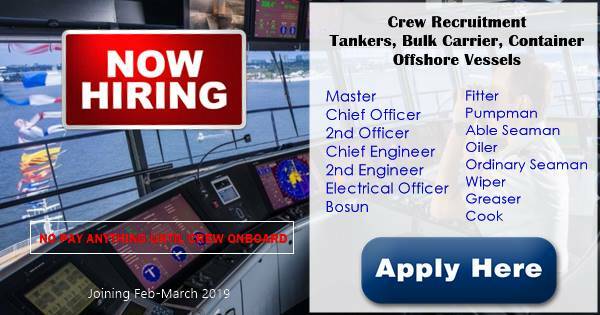 All rank with experience may apply immediately, excellent wages, terms & condition apply. 0 Response to "Crew Recruitment For Tankers, Bulk Carrier, Container, Offshore Vessels"